If you’ve ever been to the Walker Brothers Pancake House in Wilmette, you’ve seen one of these huge pancakes being delivered to a table near you. Maybe you’ve even tried this light and fluffy mass of puffed-up flour, butter, and eggs yourself. It’s the perfect thing to cook for company because it looks so impressive and unusual. But as you serve it to a chorus of compliments, smile silently to yourself, you big show-off, because it’s actually a ridiculously easy recipe. Remove your oven’s top rack and preheat oven to 425 F–the pancake cooks on the middle rack and needs space to rise. With the stove on medium heat, melt butter in a large cast-iron pan or oven-proof saute pan. 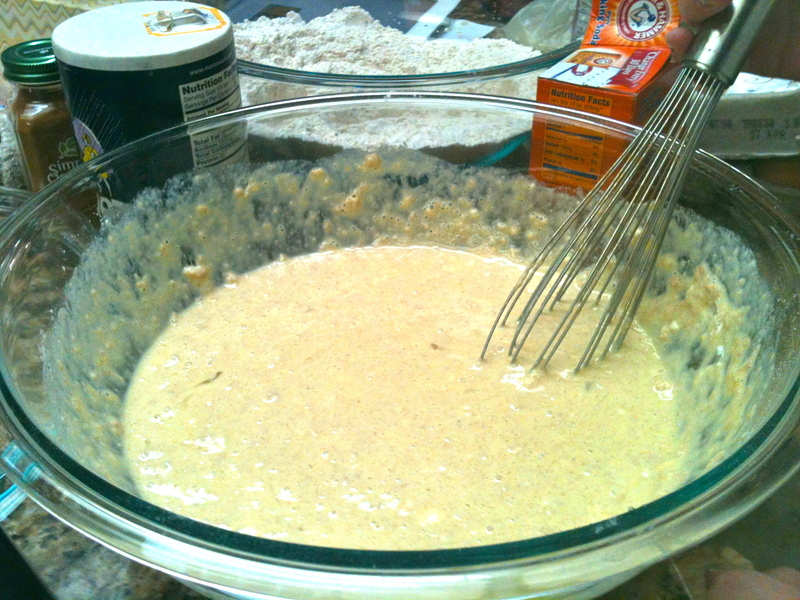 While the butter melts, combine all other pancake ingredients in a mixing bowl. 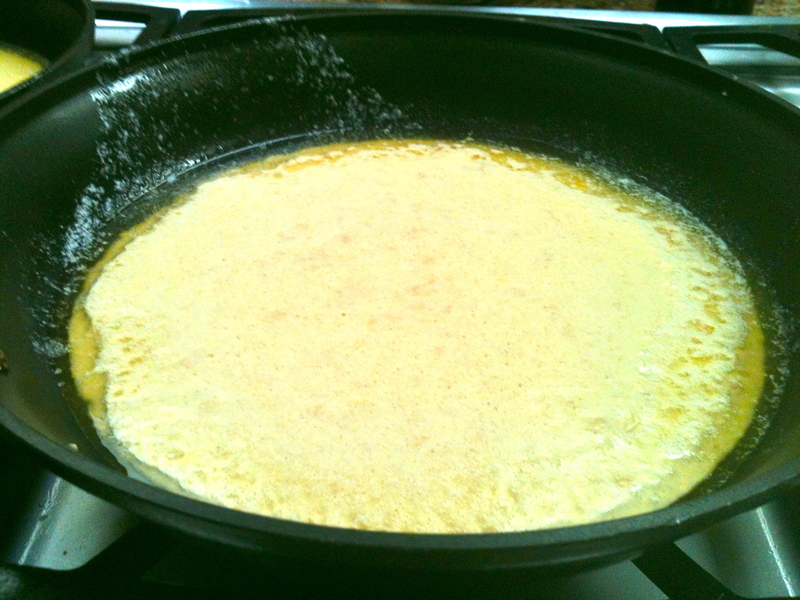 When the oven is fully preheated, pour batter into pan over melted butter, but don’t stir the butter into the batter! They should remain separate. Immediately place pan into the oven and bake for 22-25 minutes, so that the whole pancake cooks through. The middle and sides will start to brown a bit by the time the pancake is done. Remove from oven and cool about 1 minute. While the pancake cools, mix together yogurt and honey, and wash and cut up berries. Transfer pancake to a large plate. 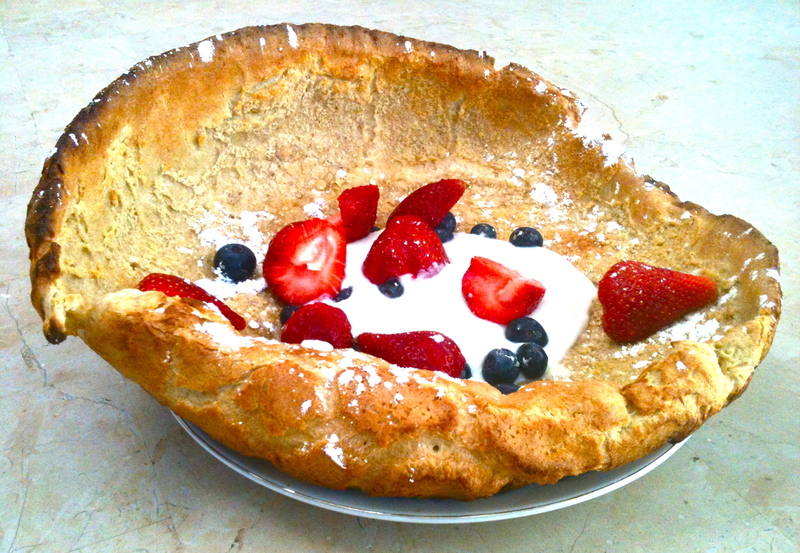 Top with yogurt, sprinkle with berries and lemon juice, and add a generous finishing touch of powdered sugar. Serves 2-3 (or a very hungry 1…). Yum! I made pancakes this morning, and will have to try this one next weekend. Thx for sharing!